You might be wondering what happened to the "special needs" kittens I acquired in October 2004. Well, it's been one year and we're still together. They are now full-blown, full-grown cats. 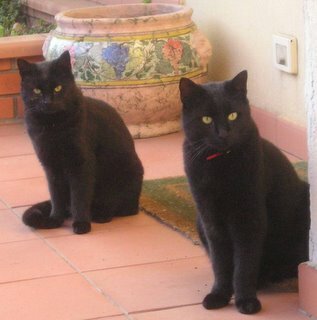 Some say they are the luckiest cats in Sicily. I don't know about that, but they have it good. They don't exactly stay outside all the time, as I had planned, but they get to come inside and visit occasionally and sleep in the laundry room in a basket. They are fairly annoying, as cats will be, but they are certainly friendly, loving, and usually well-mannered. Gosh, I went away and left them for 25 days this summer with just someone coming to feed them once a day, and they didn't even run away! Every day they are waiting for me in the driveway, no matter what time I arrive home. You can't tell them apart (well, I can, of course), so Repeat has a red collar. Pete won't keep a collar on for more than a few hours, so I'm not buying him any more. One has a missing rear right foot and the other a rear eft foot, but I can't remember who is missing which one. So, the collar is the best solution. They do have very different personalities. Repeat is much needier, and Pete is unwilling to be mean and fight back when attacked. He never bites, while Repeat does quite often. Most of the time, they love each other which they show by grooming each other and snuggling up to sleep together. But sometimes they growl and attack each other (not in a playful way as they did when they were kittens). So, I invested quite a few dollars having them vaccinated, dewormed, unsexed, deflea-ed, and micro-chipped at the American vet on base. They are officially registered. I just wish I knew someone who could make them little artificial feet or maybe rubber stumps? I am an old friend in (Carbondale, IL) of your colleague Michael M. I love seeing the pictures of the cats! They are beautiful! I hear stories about them all of the time, but it is nice to see what great cats they have become. I also love your stories and pictures about your time in Sicily--makes me feel like I am there!